Peanut Butter cookies that are soft and slightly crispy on top are the best. 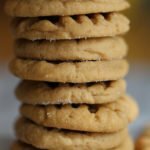 This peanut butter cookie recipe is easy to throw together and produces the perfect cookie. Once you remove from oven, cool for 3 minutes, then slide cookies while still on parchment paper to wire rack to cool for additional 15 minutes.